Gabite in game: 718 Who? Important notice! Pokemon Gabite is a fictional character of humans. Gabite (Japanese: ???? Gabite) is a dual-type Dragon/Ground Pokémon introduced in Generation IV. 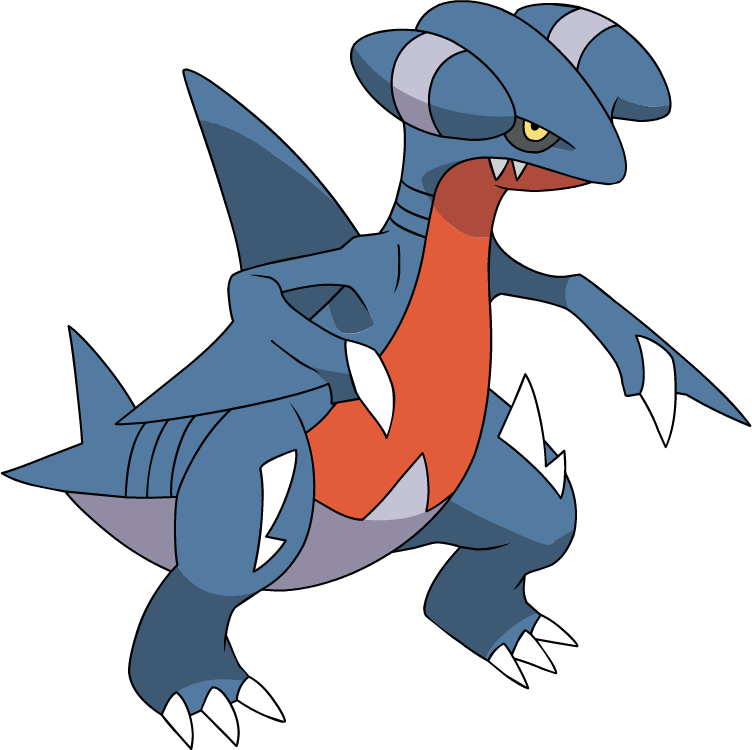 It evolves from Gible starting at level 24 and evolves into Garchomp starting at level 48. 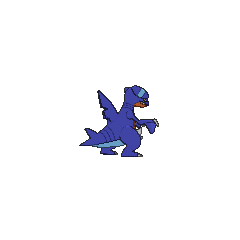 Gabite is a medium-sized, bipedal dragon-like Pokémon that is primarily blue. Its underside is light blue, with red covering it from the middle of its abdomens to the bottoms of its jaw. Gabite has two appendages that resemble jets or plane engines extending out the side of its skull. Each appendage has a blue stripe. It has four fins, one on each arm, one on its back and another on its tail. The back fin has a notch on it for the male. It has spikes on its hind limbs, and sharp claws on its feet. Its eyes have black scleras and gold colored irises. Gabite is a fierce and predatory Pokémon, known for its scales, of which have medicinal properties and can heal most illnesses. 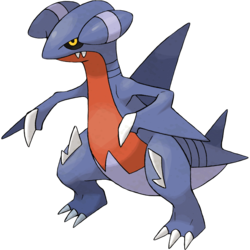 Gabite has short, extremely sharp teeth, like its pre-evolution, Gible. It has been known to move at extreme speeds. Gabite is also a very territorial creature, and will fight back against enemies to protect its home. Gabite has a habit of digging up gems and hoarding them in its nest. A Gabite appeared in Another One Gabites the Dust! under the ownership of a Coordinator named Ursula. She appeared again in a flashback in Old Rivals, New Tricks!, and has made various other appearances. Gabite made its debut appearance in Pokémon Mystery Dungeon: Explorers of Time & Darkness. It was sick of others wanting to get its scales so it wants a fight in exchange for one now. Another Gabite appeared in An Old Family Blend!, under the ownership of an unknown Trainer. A Gabite appeared in the opening scenes of Zoroark: Master of Illusions. 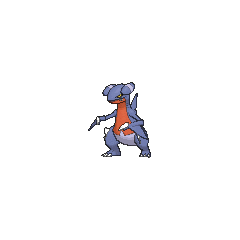 Professor Sycamore's Garchomp was shown as a Gabite in a flashback during Garchomp's Mega Bond!. DP114 Gabite Ash's Pokédex Gabite, the Cave Pokémon. Gabite goes wild for precious jewels, first digging them up and then stashing them in its nest. In the Platinum chapter, a Gabite was used by a Youngster that was challenging the Battle Factory. 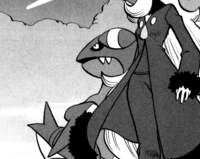 Cynthia's Garchomp was seen as a Gabite at the end of the HeartGold & SoulSilver chapter. Pokémon Mystery Dungeon: Explorers of Time, Darkness and Sky: Gabite is the boss of the password-exclusive dungeon Labyrinth Cave, as part of a tie-in with the anime special, Pokémon Mystery Dungeon: Explorers of Time & Darkness. Pokémon Super Mystery Dungeon: Another Gabite makes its home in the deepest parts of the Drilbur Coal Mine, and is first boss the player and their partner fight. It guards a horde of valuable gems, which the player and their partner agree to leave alone after hearing its case. There is a long-held belief that medicine made from its scales will heal even incurable illnesses. It habitually digs up and hoards gems in its nest. Its loot is constantly targeted by thieves. It loves sparkly things. It seeks treasures in caves and hoards the loot into its nest. As it digs to expand its nest, it habitually digs up gems that it then hoards in its nest. It loves sparkly things. It seeks treasures in caves and hoards the loot in its nest. In rare cases, it molts and sheds its scales. Medicine containing its scales as an ingredient will make a weary body feel invigorated. Shiny objects are its passion. It can be found in its cave, scarcely moving, its gaze fixed on the jewels it's amassed or Carbink it has caught. Moves marked with a superscript game abbreviation can only be bred onto Gabite in that game. It spits hunks of dirt to attack. It also slashes with powerful claws. It attacks by launching blue fireballs. For other sprites and images, please see Gabite images on the Bulbagarden Archives. Gabite shares its category with Druddigon. They are both known as the Cave Pokémon. Gabite Scales were stated to be a cure for sickness in the anime special Pokémon Mystery Dungeon: Explorers of Time & Darkness. Due to the censor that prevents Pokémon with offensive nicknames being traded on the GTS, an English language Gabite cannot be traded on the GTS without a nickname in Pokémon Black and White. 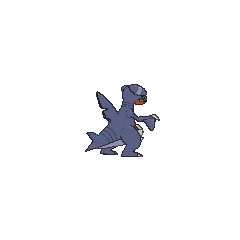 Appearance-wise, Gabite seems like a cross between a European dragon and a shark; it may be based on the landshark creature from Dungeons & Dragons. Gabite may be a combination of ???? gabugabu (to gobble or gulp down) and bite. It may also derive from ???? gaburito (bite or chew) or ???????? gaburitokamitsuku (to sink one's teeth into). Mandarin Chinese ???? / ???? Jianyálùsha Literally "Sharp-teethed land shark"